Diary of a Psychic Healer: How to Hear Your Angels? How to Hear Your Angels? I had lunch at a friend's house today, and I was lucky enough to sit next to her auntie who also happens to be a Reiki Master. We were talking about writers like Caroline Myss whom I love, and Doreen Virtue who I have fun with, even though something keeps me from trusting her work and her angel messages entirely. It might be that after two years in the UK, I've lost touch with the very polished, packaged, consumer vibe in the USA. It just feels a little bit too polished, and a little bit too perfect. Almost too good to be true … that’s how I see Doreen V.
My friend’s auntie also had a really good point about whether or not there really are humans who can see and hear the Archangels. A few weeks ago, in one of my meditations I asked my Spirit Guides why I could see and hear them, but I could only sense the presence of the angels. Their response was that an angel's vibration is too high for me to have direct contact. I just had to trust that they were with me and know that they were looking out for me. 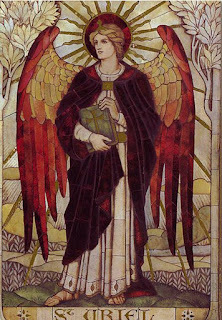 Even now if I ask Archangel Michael for help, I'll reflect on what I need help with and then I get on with it. Only after the day has gone by will I start noticing all the little miracles that happened along the way. So today my skeptical side made an appearance. I'm sure there are people out there with higher vibrations than mine, after all I am still a newbie with lots to learn and a lifetime ahead of me. I am wondering, has anyone actually seen or heard an angel? And if so, will you tell us about it? My friend is an incarnated angel - so yes, I can see and hear her :). But I guess that doesn't count :). Most people I know never actually saw an angel, but they can communicate with these beings. But I have one friend who can perceive etheric beings and he have seen real angels few times. As for Archangel Michael - from my perspective we're not talking about angel here, but about an egregore, a being created by belief and magical practices. That's why I'm always telling people "beware of famous angels you're working with". Angels are out there, but egregores are more likely to be contacted. I hadn't heard the word egregore, but I've seen the same concept applied to mythical creatures that are said to exist in other dimensions: i.e. dragons, unicorns, Merlin, Yoda (ahem!). We did a meditation in class with a little dragon that is supposed to assist with a psychic reading. Its the most fun that I've had with a meditation to date. No need for kidding, I'm sure Yoda's thought-form or entire egregore is already out there. An egregore is a magical term, it's an entity created because of our thoughts and beliefs , that exists on astral planes. Basically every strong thoughts or beliefs can create an egregore - it means the astral planes are filled with Norse gods, deities, Star Wars spirits, Lovecraft's demons and religious gods and goddesses. Just flashes of color...I believe it was Raphael. I saw a green light in my bedroom when awakened from a dream. Also, I have felt Chamuel's presence when calling on him. Michael is a bit more difficult, but I feel he is guiding me through. I'm new to this, and it will be interesting to discover how I "see" angels as time goes by. Will keep you posted. Peace and blessings!